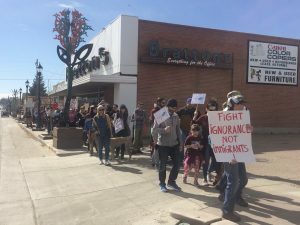 On a sunny morning in early March 2017, over 400 people hit the sidewalks of Greeley, a small city on Colorado’s Eastern Plains. A diverse crowd in sweatshirts, blue jeans, robes, ankle-length skirts and headscarves, they marched to show their support for the city’s sizable refugee and immigrant population. They started at the University of Northern Colorado, wound toward downtown and ended up at the Global Refugee Center, a local nonprofit.